The 2014 Source to the Sea is officially open for registration. This year's theme, "Healthy Environment—Healthy Lifestyle" introduces some added activities on several legs of the trip down the river. Added activites include several hikes on select paddling days and some additional days just for hiking regional mountains and trails. The Androscoggin Source to the Sea Trek is the ARWC's signature event, happening each summer since 1995. Each year we paddle the majority of the Androscoggin's 170+ miles, welcoming paddlers to join us for one day or many as we celebrate how far the Androscoggin has come in the past generation. The river is an incredible resource for paddling and fishing, home to abundant wildlife on every stretch, and an asset to the communities on its banks, and we believe the best way to understand the river is to experience it first-hand. 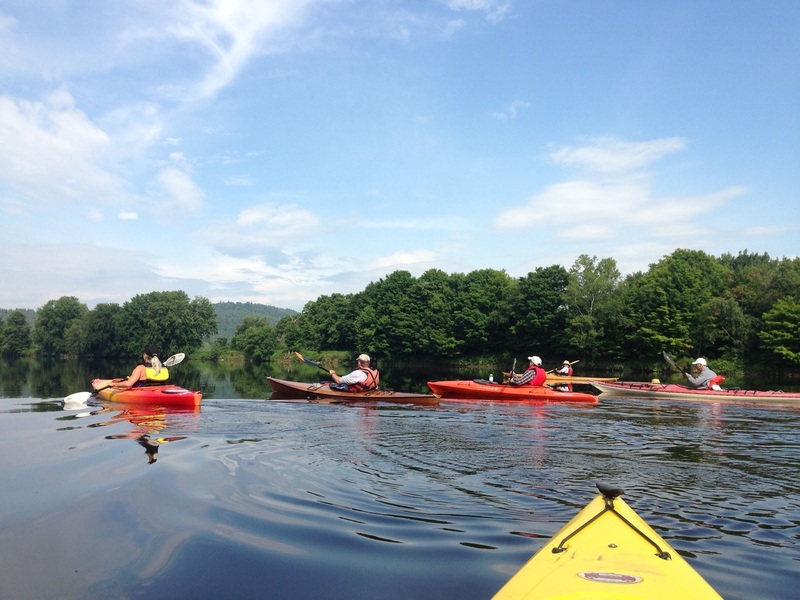 Check the list of events on this page to register for either a paddle on the river, a hike to view the river from select vistas or both. Check back regularly for updates and trip details as they develop. This is a fun trip you don't want to miss! The Guides are expertly trained and so much fun on the river. 12:30 PM Meet at the Mahoosuc Outdoors on Rt. 16 just north of the center of Milan. You will enjoy two raft trips down the river and enjoy a great meal after rafting. The cost is $79.00, all inclusive, and you must register on Mahoosuc Outdoors website. You will be required to give credit card information to reserve a space on the raft trip. No shows are non refundable. Check their website to register or call for more information. Raft trips are led by trained Mahoosuc Outdoors guides. Check out Mahoosuc Outdoors to learn more about the outdoor adventures he offers year round.The whitewater leg offered today starts at 12:30PM. Brookfield begins releasing water from the dam after 10AM from Pontook Dam for white water adventurists. Click here for more information on water releases on Pontook and other dams throughout the year. I have done this trip a couple time and it is always a great ride down the river. You will be guided by trained white water guides and wet suits will be provided. After rafting, the Mahoosuc Inn serves a great meal choice of chicken, salmon or steak; potato salad, green salad and the best chocolate chip cookies ever. Beer and wine are available on a cash basis. When you sign up with Mahoosuc Outdoors, you can choose your meal choice. Presenters: Mahoosuc Outdoors White Water Guides. Raft trips are led by trained Mahoosuc Outdoors guides. Check out Mahoosuc Outdoors to learn more about the outdoor adventures he offers year round.The whitewater leg offered today starts at 12:30PM. Brookfield will release water from Pontook Dam after 10:00AM for white water adventurists. Click here for more information on water releases on Pontook and other dams throughout the year. I have done this trip a couple time and it is always a great ride down the river. You will be guided by trained white water guides and wet suits will be provided. A beautiful leg of the Source to Sea—Bofinger Preserve to Nansen Wayside. Guided by Mark Peabody of the Mahoosuc Inn and North Woods Rafting, come and enjoy a leisurely trip through a popular fishing section of the Androscoggin River. Please meet at the Mahoosuc Inn at 9:30 where you can rent kayaks and enjoy shuttle service provided by Mahoosuc Inn staff. Please indicate if you will need a kayak for the day's paddle. After taking out at Nansen Wayside, lunch will be served at Mahoosuc Inn for $10.00 your choice of salmon, steak or chicken. Beer and wine available at the Inn. Cash bar. A morning paddle for all of those who want to take a lazy river paddle and follow up with an afternoon in Bethel. We will be back in plenty of time for enjoying shopping and dining in the Bethel area. It is beautiful, easy paddle through the hills with lots of interesting islands. Shallow and relatively fast with lots of islands and sand bars for lunch. Look for the blue Androscoggin River Trail sign on Route 2 in Gilead. All employees of the Verso Androscoggin Mill are encouraged to participate. Water conditions permittig, we may get to paddle around Steven's Island. Eight mile paddle about 3 hours. This is a beautiful paddle down river with views of boom piers used to funnel logs down the river to various paper or logging mills. Come enjoy a bird watch with Mahoosuc Land Trust at their new home the Valentine Farm on North Road in Bethei. The Valentine Farm borders the Androscoggin River and MLT will be our bird watch guides for this early morning watch. This is a special day to invite you to come and enjoy and learn about the work the MLT does along the Androscoggin River watershed. This beautiful hike offers great nature rewards and an opportunity to view regional birds in their natural habitat. Come join us for a morning hike to get your metabolism pumping. Just another way to promote "Healthy Environment-Healthy Lifestyle" our continuing theme for the Androscoggin River Trail Source to Sea. Limited number of binoculars available so bring your own if you have them. Meet at Mahoosuc Land Trust at 7:00 AM for a two hour bird watch. This event is sponsored by the Androscoggin Land Trust. Always a fun time and a great way to meet and talk river talk with the folks from the Androscoggin Land Trust. Munchies provided at Gritty's after the paddle compliments of ALT, but opportunities nearby to get a meal if you need one before or after you paddle. The Androscoggin Land Trust is a non-profit membership-supported organization dedicated to protecting through land conservation and stewardship, the important natural areas, traditional landscapes, and outdoor experience in the Androscoggin River watershed. The land trust currently conserves approximately 4,850 acres of land, including over ten miles of riverfront along the Androscoggin River. We also work with municipalities to help steward trails and other recreation sites throughout our service area. Please visit www.androscogginlandtrust.org for more information. Click below for location of put in. Beautiful, rural paddling from Leeds to Turner. Ends at the gateway to Androscoggin Riverlands State Park. A great section for bird sightings. Bring a lunch to enjoy at the take out in Turner where we will have Tom Mapletoft speaking about Brookfield Renewable Energy and dam safety. Meet at 8:30 am on Googin's Island (between the Twin Bridges) on Route 219 in Leeds. Shuttling directions: Turn left out of the parking lot. After going over the bridge, stay left on Route 219. After 1.7 miles, turn left to stay on Route 219. After 4.3 miles, turn left on Route 117/North Parish Road. After 2.1 miles, turn left on Center Bridge Road. The boat launch is on the Leeds side of the bridge. Notes: A quick, easy paddle. We plan to arrive at the takeout by lunch at a good clip. A mellow and scenic round-trip paddle from Auburn to Rancourt and back. You just might see an eagle or two. Meet at 8:30 am at the North River Road boat launch (behind Wendy's on Center St. in downtown Auburn), paddle to the Androscoggin Land Trust's David Rancourt Preserve, take a short hike on the preserve. Notes: Put in at the North River Road launch in Auburn and paddle about 1.75 miles upstream until you reach a small sand beach on the Lewiston side of the river. This is the Androscoggin Land Trust's David Rancourt Preserve, which has some trails through the woods. Paddle back to the start. Current is slow to non-existent because the put-in is just above Great Falls Dam and the Rancourt Preserve is just below the Deer Rips Dam. Plans to meet at Rolly's, a local diner for lunch after the paddle. Today's paddle has been changed to an out and back from the Brunswick Mill Street boat launch. Please check the River Trail Guide on our website for directions to where the Mill Street launch is. If you have signed up and decide not to attend for whatever reason, please call the trip leader, Michelle Moody, at 207-406-5221. Put in:Click here and click on the Mill Street Access Point. Trip leader: Michelle Moody, AMC Maine Chapter Leader; 207-406-5221 for questions or information on the launch site or paddling leg. On river event: Highlights of the Brunswick Topsham Land Trust Conservation efforts. Take out TBD closer to date of paddle. River Event: End of S2S will start at Water Street in Brunswick and end at the Sea Dog in Brunswick for after S2S trip down the river. After the paddle we will hold our end of S2S party at the Sea dog for raffle drawings and food and beverage. Booze is pay on your own. ARWC Will provide food. ARWC will draw names for the numerous gift card and vouchers donated to the Source to the Sea by area businesses. Come join us for the fun paddle, and the drawing for many door prizes at the Sea Dog Brewery in Brunswick ME. By signing up with us to paddle you are automatically entered for a chance to win. Put in time is 08:30 AM and party at Sea Dog will be at 2:00 after the paddle. Friday, July 21, 2017 Source to Sea Day 9 - Mexico to Dixfield. Friday, July 24, 2015 Source to Sea Day 11 - Mexico to Dixfield. Friday, July 25, 2014 Source to Sea Day 11 - Mexico to Dixfield. Sunday, July 28, 2013 Trek Day 11 - Riley Dam to Otis Mill w/ Picnic on Pine Island.